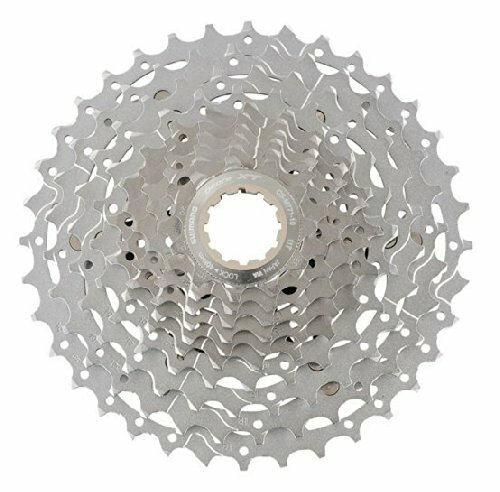 High performance 10-speed Dyna-Sys cassette. Hyperglide sprockets have a computer designed tooth configuration with contoured shift gates, resulting in a crisp smooth shift even under load. Six largest sprockets are mounted on lightweight alloy carriers to reduce weight and increase rigidity. Sprockets are cut away and drilled to further reduce weight without reducing rigidity. 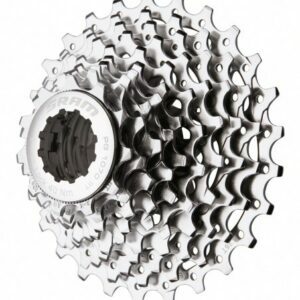 High performance 10-speed Dyna-Sys cassette. Hyperglide sprockets have a computer designed tooth configuration with contoured shift gates, resulting in a crisp smooth shift even under load. Close ratio gearing allows a more efficient use of energy through finer cadence control. Six largest sprockets are mounted on lightweight alloy carriers to reduce weight and increase rigidity. Sprockets are cut away and drilled to further reduce weight without reducing rigidity. Chrome-plated finish offers hard wearing resistance to corrosion. Alloy cassette lockring. For 10-speed HG-X MTB chains. Weight: 323 g for 11 – 34T. Alloy cassette lockring. For 10-speed HG-X MTB chains. Weight: 323 g for 11 – 34T.